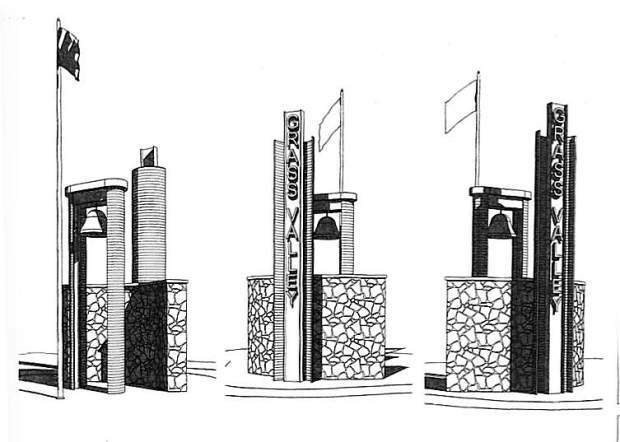 This architects rendering of the proposed Grass Valley entryway sign, shows what the monument would look like from three different angles. The monument is also slated to commemorate Grass Valley's firefighting heritage. T he City of Grass Valley’s planning commission is set to consider the design of a 20 foot tall community monument sign proposed for the corner of Neal and South Auburn streets, at their meeting Tuesday night. The city has been seeking to develop a sign program to create distinctive entryways into Grass Valley that follow a certain criteria. The monuments must: Reflect the community’s historic past and strong future; be affordable; and be capable of being scaled from 20 feet tall, down to four feet in order to accommodate a wide range of locations. The first of those proposed monuments, designed by architect Robert Wallis, draws inspiration from the sign atop the Del Oro Theater, and will replace the existing entryway signage. Three elements make up the proposed monument: the vertical 20 foot metal sign with the words Grass Valley spelled out in 12 inch Halo lite letters; an 8 foot high mine rock quarter round wall; and a 16 foot high fire station bell structure relocated from the old fire station. A commemorative plaque honoring area firefighters who have fallen in the line of duty is also planned for the back of the mine rock wall. Additionally, a 25 foot high flag pole will be located behind the old fire station bell. The design and placement of the proposed entryway sign will not require the removal of an existing monument tree located nearby. Tuesday’s planning commission meeting is set for 7 p.m.